As promised in last week’s introduction, I’m kicking things off with Uncanny X-Men #193—the hundredth issue since Giant-Size X-Men #1, which was, of course, the first appearance of the “new” X-Men team. It’s from 1985, right smack in the middle of the first of my two favorite X-Men decades. The five years of comics preceding it gave us two incredible, epic stories: the Dark Phoenix Saga and the Days of Future Past. Not to mention the death of Jean Grey, the introduction of several villains—the Brood, the Hellfire Club, Mystique’s Brotherhood of Evil Mutants– and the Morlocks along with hero characters Dazzler, Shadowcat and Rachel Summers, among others. Cyclops has married a woman, Madelyne Pryor, who looks just like his former love, Jean, and Storm, who took over leadership of the X-Men, has lost her powers to a machine created by Forge, a mutant inventor. Uncanny #193 is written by Chris Claremont, of course, with art by John Romita, Jr. and Dan Green. Like any other X-Men book of the Claremont era, there isn’t too much that could have been executed any better. It opens on Muir Isle with a beautiful splash page of two “Giant Sized” X-Men characters that haven’t been part of the team in a long while—Banshee and (apparently) Thunderbird (actually his younger brother, James Proudstar, wearing his deceased brother’s fighting togs). It’s worth noting that Romita Jr., though still active in comics today, has a much different artistic style than he did in the 80s; only in the early to mid-nineties did his art begin to look the way today’s comic fans are used to. I read a lot of these older issues after getting deep into X-Men in the 90s, and didn’t even realize it was the same guy at first! A few pages in, we get a look at a hilariously punk-rock Charles Xavier, saved from a violent attack by the Morlocks and Callisto, their deputy leader and somewhat of a biker-babe type herself. We run into some of the new Thunderbird’s team-mates: the Hellions, Emma Frost and the Hellfire Club’s answer to Xavier’s newest recruits, the New Mutants. James Proudstar is hellbent on making Xavier pay for a scenario that hearkens back to the very earliest issues of the “New” X-Men—his brother’s hero’s death in one of the new team’s first battles, against Count Nefaria. We get a few great pages of the X-Men and New Mutants training together in the Danger Room, before the leather-clad Xavier makes his appearance, with about as much dignity as one can muster under such circumstances. Then Proudstar makes his demands over the X-Men’s communications system—he has Banshee, and he wants Xavier and the X-Men to come and get him. No, seriously, WHAT DO YOU MEAN?! I’m not going to spoil the rest of the book for you, but suffice it to say it comes to a satisfying conclusion, especially for fans of 90’s X-Force mainstay Warpath (whom Proudstar ends up becoming, eventually), and all in one issue. Uncanny 193 clocks in at 40 pages of story, not surprising for an anniversary issue. Whether by design or not, Claremont manages to involve all the characters introduced 100 issues ago, save Sunfire. Even though Storm’s no longer part of the team at this point, we do spend a page on a boat with Ororo in the mid-Atlantic, on her way back to her homeland. And finally, we get resolution to a conflict seeded roughly ten years prior by Claremont; almost certainly, the younger Proudstar wasn’t even a twinkle in his eye at the time of the elder’s death, but the character had been introduced about a year earlier in New Mutants. While Proudstar does elect to remain with Frost’s Hellions, he’s never again an enemy of the X-Men. One final note—this issue features Nightcrawler’s first outing as field leader, in the absence of traditional leaders Cyclops and Storm. Next week—NIMROD picks a fight with the unstoppable JUGGERNAUT! Read along in Marvel Unlimited (or with an old floppy!) and let us know what you think! We’ll be back talking Old School X-Men with Lincoln every Tuesday. Nimrod vs. Juggernaut in #194!!! You wouldn’t believe how hard a time I had deciding on a starting point for this column. I was half-tempted to start with Giant-sized X-Men and work forward, but right around here is really *my* era…the stuff that was written while I was growing up. Initial thoughts – Punk rock Xavier is my favorite discovery this week. I’m going to use that image constantly. Wolverine is so much more fleshed out here than he is during those Phoenix/Hellfire earlier issues. This is the character I know and love. Love the JR JR fight panels between him and Proudstar 2.0. 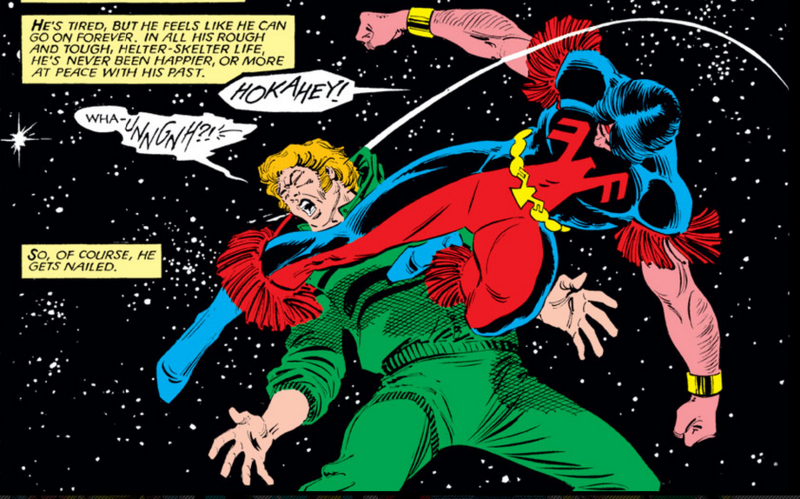 I think I’m with Kurt – so far I’m really liking this early artistic styling. This era was SOOOOO good. Pretty much going from Kitty’s “demotion” to the New Mutants to right after the Mutant Massacre is my Golden Age of X-Men. John Romita Jr. was at the height of his powers during this time. I know he’s been given Superman, but to me, his pencils have gone downhill significantly.